Often, the most overlooked aspect of any wedding is quality entertainment for the evening reception. Firstly we understand there is usually a wide range in age at weddings and the fact that in the modern day, families often only ever really meet up at such functions, With this in mind we strive never to be to loud. Equally our lighting for wedding is softer and more romantic, we can also provide themed room up lighting that is in keeping with your wedding theme. Musically we approach weddings much like a band would, and less like the formal nightclub DJ style adopted by so many other discotheques. We carry music from the 20’s to latest Chart. 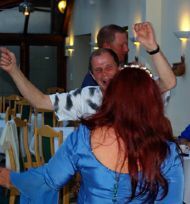 Traditional Scottish Ceilidh music is often a must, we have all the music required to do a whole Scottish Ceilidh night if required. Also its your wedding and we will delighted to discuss with you and tailor your play list to YOUR requirements. Over the years ‘Nightowl’ have arranged to mention just a few, themed, Line dance and Northern Soul weddings, the list is endless. If you have any ideas on a theme for your reception we are always happy to discuss these with you, after all, it is YOUR night! We will play the music you have chosen for your first dance, and formally introduce the Bride and Groom then Bridal Party, endeavouring to introduce the two families together for a fun filled romantic evening,. Usually Weddings ‘take off’ after the buffet…. 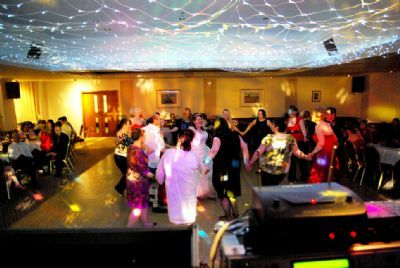 Wedding Karaoke option is a very popular addition to any Wedding party, after all what’s a Scottish Wedding without a Family sing song? We will be ready to play before your guests arrive whenever possible, and will wait until they have left before ‘racking down‘. Our DJs are always properly attired and usually in Scotland will work in a Kilt, we enforce a strict no drinking policy, and our DJs are always respectful of clients and the surroundings. I just wanted to say a massive thank you for sunday night. You played fantastic music and everyone thoroughly enjoyed it. Gordon, Thank you so much for everything you did to make the Wedding on 10th October in the Mercure such a success. Everyone we have spoken to were knocked out by the night. Seeing Scooty & the Skyhooks dancing to their own music was quite weird, but they loved it.